It is vital that you develop good graphing skills. 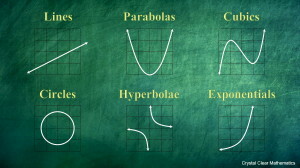 Graphs link geometry, algebra, calculus, and rates. Being able to read a graph means that you can make meaningful observations about an abstract concept, or some real event, or a physical situation, or some statistical summary. Your understanding of axes, of dimension and proportionality, of steepness of lines, of curvature, and of intersections between lines will inform many of the observations and decisions that you make mathematically. When you start on this journey of discovery at school, you will first learn how to think of a function as an input-output machine. You will use this ‘machine’ to calculate/find a series of points. You will list the coordinates of these points in a table of values, and then plot the points on a graph, and join those points with a line/curve. 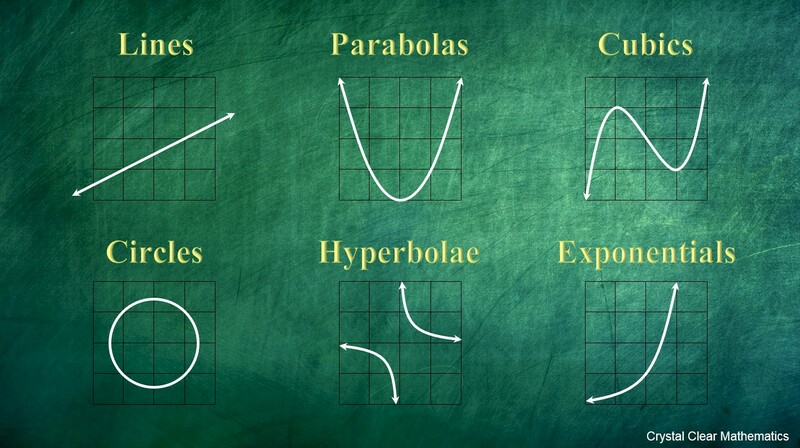 This is how you will learn to graph each function type. You will be shown that straight lines and their equations behave in certain ways, and learn about intercepts with axes and gradients of lines. After that, you will start to discern that there are ‘families’ of functions and that all the graphs belonging to a particular family behave in similar ways. The basic six families that you will learn about are shown in the image above. It is important that you study all six of these ‘families’ and learn their characteristics, their idiosyncracies, and the particular features special to each one. I will try to add material to this section of the website to help you do all that. By the time you have mastered all six graph types, you will also have learned how to move a graph anywhere on the plane that you wish, and how to change some of its key features. You will then be introduced to more graph types … logarithmic graphs and trigonometric graphs will come next. At every step you will consolidate some older skills even more, and learn new ones. This is a wonderful and satisfying skill to develop and, like any skill (driving a car, swimming, dancing, etc.) you will get better at it with experience and practice … recognising that there can always be new surprises and new lessons around the corner! This is a life skill for training your mind to think abstractly, logically, and in pictures. I hope you are ‘up for the challenge’ and eager to earn your licence!